The Advantage2 Silver features a painted silver gloss finish, low-force Cherry MX Brown tactile mechanical key switches, the rubber function keys (found on the original Advantage) have been replaced with Cherry ML low-force, tactile mechanical key switches, and two sets of our signature home row keys – Dark Gray and the new “Kinesis Blue”. The key wells are scooped into a concave shape to reduce hand and finger extension. Hands rest in a natural, relaxed position, with the fingers curled down to the keys. Keycap heights are varied to match the different lengths of your fingers. The result is less muscle tension and a shorter reach for keys which increases efficiency and reduces fatigue. Separating the key wells positions the arms at shoulder-width to keep wrists straight and perpendicular to the home row. Typing with straight wrists is essential in avoiding injuries because it reduces abduction and ulnar deviation which can lead to pain and injury. The thumb keypad includes often used keys such as Enter, Space, Backspace, Delete and the combination keys, Control and Alt on the PC (Command and Option on the Macintosh). This redistributes the workload away from your relatively weaker and overused little fingers to stronger thumbs as well eliminating extension for these more distant keys. The two key wells are “tented” at an optimal 20 degree angle moderately raising the thumb side of the hand Tenting puts you in a more neutral, “handshake” posture and reduces the stresses caused by forearm pronation and static muscle tension. The keys are arranged in vertical columns (“orthogonally”) to better reflect the natural motion of your fingers. The staggered keys found on conventional keyboards are just an artifact of the original typewriter design and only serve to slow you down. Vertical keys reduce awkward extension and travel, and they also increase speed, accuracy, and overall comfort. The Advantage2 Silver (KB605 model) utilizes the Cherry MX low-force tactile switch (brown stem). It is a semi-custom low force tactile design created in 1992 to Kinesis’ specifications. “Tactility” is a slightly elevated force around the midpoint of the stroke of the key which lets you know the switch is about to be activated. A tactile response is preferred by many ergonomists, because it cues yourfingers that activation is about to occur and is thought to reduce the likelihood or incidence or “bottoming out” the switch with a hard impact. The peak (tactile) force is ~55gm, following by an activation force of ~45 gm. 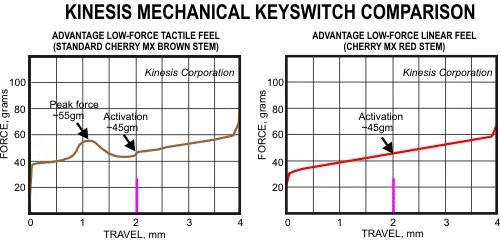 Long-time Advantage users will rejoice to learn that we’ve replaced the mushy, rubber function keys with high-performance Cherry ML switches that offer the same low-force and tactile properties of the MX Brown. The Advantage2 may look big, but it actually has a smaller footprint than a traditional keyboard and even many “ergonomic” keyboards because we eliminated the numeric 10-key. A smaller footprint lets you place the mouse closer to your body, reducing painful “over-reach”. To satisfy number crunchers, we embedded a traditional 10-key in the right key well. We also offer a standalone low-force mechanical keypad which allows you to position it where you want it and move it out of the way when not in use. We understand that learning a new keyboard can be difficult. That’s why we designed custom “cupped” keycaps for the home row to keep you anchored while typing. And just in case you need a little extra help, we made them in a stylish gray that enahances the silver gloss finish and provides for a quick visual reference. Also included with every Advantage2 Silver model is a set of Kinesis “Blue” home row key caps. To encourage proper typing form, the Advantage2 features an optional electronic “click” that sounds right when a key press is registered. The click trains you not to “bottom-out” on each key press which reduces unnecessary impacts to your fingers. The click sound can be deactivated with the touch of a button. Switch to the standard Dvorak layout with the touch of a button and create custom Dvorak layouts with remaps and macros that are saved to the keyboard. Switch between QWERTY and Dvorak without losing any settings. All Advantage2 models come with an available Dvorak layout but Dvorak users will want to purchase the Advantage2 QD (black only) for the dual-legended QWERTY/Dvorak keycaps. Attention current Advantage Dvorak users: You now get all of the same functionality as QWERTY users, and each custom Dvorak layout is saved to the keyboard so it’s easy to move back-and-forth or share your keyboard. And when you’re remapping in Dvorak, you no longer have to translate from QWERTY. With SmartSet, all your custom layouts are saved and stored as basic .txt files directly to the keyboard. These files can be opened with any text editing program, on any operating systems. Edit your remapsor macros from the text file or insert new actions using the keyboard HID codes. You can also run a quick Status Report to confirm current keyboard settings. Since each layout on the Advantage2 is stored as a basic text file (typically less than 1KB), they are super easy to save, backup or even share with a friend. The days of rebuilding your custom layout fromscratch are over. When you invest in an expensive keyboard, you expect it to last. Thanks to the SmartSet engine, its easy to upgrade the firmware when new versions become available. And it doesn’t require opening up the keyboard or downloading a scary executable file (.exe) from the internet. Choose from 9 different macro playback speeds. Set the playback speed globally for all macros or set it for a specific macro to optimize performance. Slow playback down to 4.2 characters per second (“CPS”), or speed it up to a blazing fast 250 CPS- equivalent to typing 3,000 words per minute! 2 MB onboard (non-volatile) memory. Original Advantage: Mushy rubber function keys. Advantage2: You asked for it and we delivered. The function key row now features low-force Cherry ML mechanical key switches that offer a satisying, tactile key press plus unmatched reliability and durability. Original Advantage: 2 KB of onboard memory (Advantage Pro had 4 KB). Advantage2: The Advantage2 has 2 MB of memory, as in megabytes, which is 1000x more memory than the standard Advantage. Now you have an enormous amount of space to record macros and build custom layouts. Advantage2: Each custom layout built with the SmartSet engine can now support 100+ “heavy-duty” macros of more than 200+ characters in each. SmartSet allows you to create even more powerful macros through the direct editing process. Insert delays into macro playback of either 125ms or 500ms, or trigger different actions on the press and release of a given macro trigger. Original Advantage: When you remapped a key or recorded a macro you had no easy way to track you changes or perform any updates. Advantage2: With SmartSet, all layouts are saved and stored as basic .txt files which can be opened with any text editing program on any operating systems. Open the text file and directly edit your remaps or macros. Even insert new actions using many standard USB hex codes. Original Advantage: There was no way to share or backup layouts. You had to keep a separate crib sheet if you ever wanted to rebuild your custom layout. Advantage2: Each layout is stored as a basic text file making them easy to save, backup or even share with a friend. The days of rebuilding your custom layout from scratch are over. Original Advantage: It was easy to forget which layout was active, which thumb key mode you were in and other keyboard settings. Advantage2: Thanks to the new Status Report feature, you can quickly “print-to-screen” a Status Report showing you basic information about the active layout include the number of key remaps and macros, and your thumb key mode. Original Advantage: All macros played back at one speed. Advantage2: Choose from 9 different macro playback speeds. Set the playback speed globally for all macros or set it individually for a specific macro to optimize performance. Slow playback down to 4.2 characters per second (“CPS”), or speed it up to a blazing fast 250 CPS- equivalent to typing 3,000 words per minute! Original Advantage: Only supported one custom layout. Advantage2: With the Advantage2, you can now create dozens of custom hotkey layouts for either QWERTY or Dvorak and access them with a simple 2-key combination: Program + the assigned hotkey. Original Advantage: When you switched out of Dvorak you lost your settings. When you remapped keys in your Dvorak layout you did so in QWERTY. Advantage2: Dvorak is no longer a second-class citizen. Dvorak users get all the same functionality as QWERTY users, and each custom Dvorak layout is saved to the keyboard so it’s easy to move back-and-forth or share your keyboard. And when you’re remapping in Dvorak, you no longer have to translate from QWERTY. Original Advantage: Firmware was not upgradable. Advantage2: When you invest in an expensive keyboard, you expect it to last. Thanks to the SmartSet engine you can upgrade the firmware when new versions become available. Firmware updates take only seconds and don’t require opening up the keyboard or downloading a scary executable file (.exe) from the internet. Advantage2 features a more vibrant, modern home row accented in Kinesis Blue.